Wishlists can be used to cross promote products on your shop. Wishlist items can also be displayed directly on the cart page in order promote products of interested while the customer gets ready to start the checkout process. 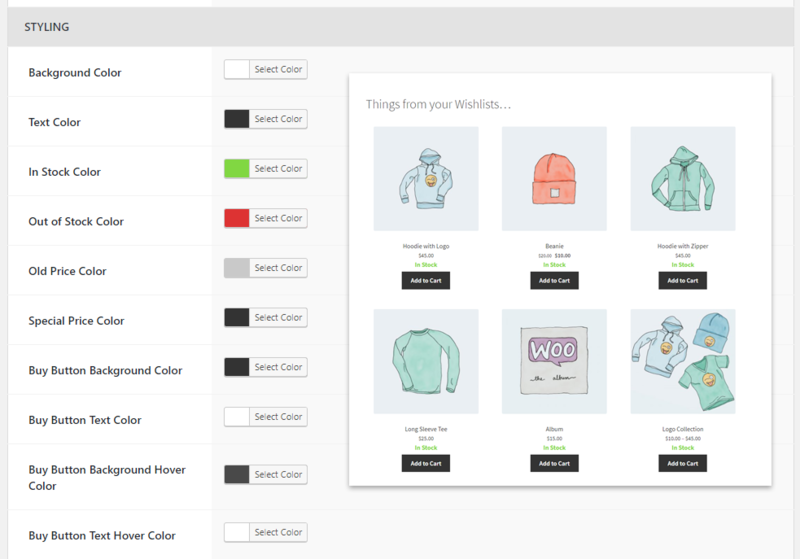 Displaying wishlist items on the cart page can be a powerful tool to bringt customers buy more products from your store. 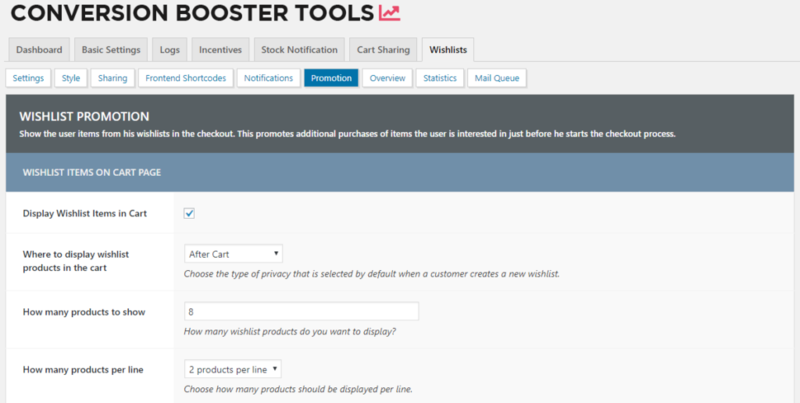 The products that get displayed on the cart page get grabbed from all available wishlists the current customer has. In the plugin settings you have the several options that go from basic functionality to the styling of the wishlist products. Activate or deactives wishlist items on the cart page. You can choose between several hook points for the wishlist products to be shown. You can for example display theme before the cart contents are beeing displayed, or move them under the proceed to checkout button. Depending on your theme not all listed hook points may work. If items from wishlists are not beeing displayed on the carts page try to change this setting. You can show up to 5 products per line. This can help if you want to display more wishlist items on you cart page. There are many different styling options available to you. Related wishlists on product pages show wishlists the currently viewed product can be found in. In many cases this can show the visitor products that are somehow related to another. The settings for related wishlists can be deactivated, you can limit how many wishlists should be displayed and how many products need to be in a wishlist in order to be qualified to be displayed. 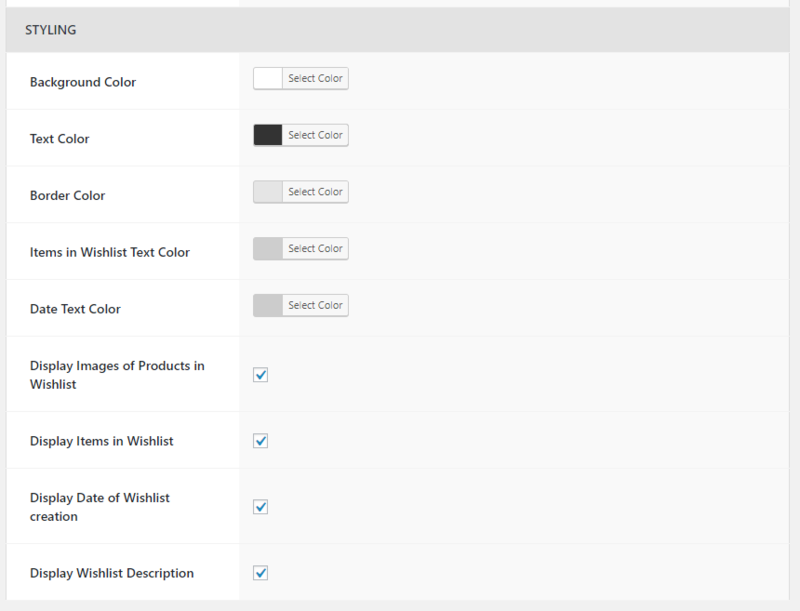 You have the option to change the colors of the wishlist table that gets displayed on product pages. You can also choose what kind of information should be displayed.